Booking Judy Baca - SPARCinLA We are SPARC: Art | Community | Education | Social Justice SPARC | Social & Public Art Resource Center | Creating Sites of Public Memory Since 1976 | Founded by Judy Baca, Donna Deitch & Christina Schlesinger | SPARC is a community cultural center that creates public art as a vehicle to promote civic dialogue, foster cross-cultural understanding, and address critical social issues. We accomplish our mission by producing, preserving and presenting community-based public art. SPARC is a facilitator Ð finding ways to tell richly textured stories that help community participants and artists achieve a measure of change and transformation. Baca is a native Angeleno, a visual artist, arts activist, community leader and educator. 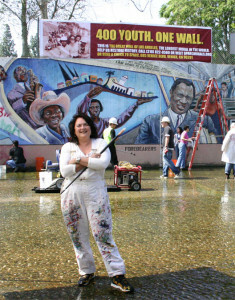 Baca is best known for her large-scale public organizing murals. Her art involves extensive community dialogues and participation. Baca founded the first City of Los Angeles mural program in 1974. In 1976 she founded the Social and Public Art Resource Center (SPARC) in Venice, California. SPARC is a socially relevant, activist minded and spirited organization, at the heart of what it believes is that art is a tool for social change and self-transformation. Baca’s true signature piece is “The Great Wall of Los Angeles”: As a site of public memory, the Great Wall is one of Los Angeles’ true cultural landmarks and one of the country’s most respected and largest monuments to inter-racial harmony produced with the participation with over 400 inner city youth, 40 ethnic historians and 100’s of community residents. Baca and SPARC continue to work on The World Wall: A Vision of The Future Without Fear, which consists of eight 10ft x 30ft portable mural panels on canvas. This 240ft mural addresses contemporary issues of global importance: war, peace, cooperation, interdependence, and spiritual growth. As the World Wall tours the world, eight additional panels by artists from eight countries are added to complete this visual tribute to the “Global Village-An Arena for Dialogue.” To date Finland, Russia, Palestine/Israel, and Mexico panels have been added; Canada is currently being worked on. To advance the field of muralism, in 1996 Baca created the UCLA@SPARC Cesar Chavez Digital/Mural Lab, a research, teaching and production facility based at SPARC. She serves as a Distinguished Professor in the UCLA Department Chicano/a Studies and World Arts and Cultures Department. In 2010 she completed the Cesar Chavez Memorial at San Jose State University, and the Robert F. Kennedy monument at the Old Ambassador Hotel site, which is now the LAUSD K-12 RFK Community Schools. She is currently working on a digital painted mural for the Richmond Arts Center in Northern California and a interactive digital mural for the Miguel Contreras Learning Complex in downtown Los Angeles. —-Taken from Nina Simons co-founder of the Bioneers biographical sketch of Judy Baca. The Bioneers are engaged citizens from all backgrounds and fields who focus on solving our world’s most urgent problems within a framework of interdependence by networking scientists, artists, scholars and others internationally to work together. Baca is at the top of a distinguished list of artist creators. What sets her apart from many other artists is an inspired ability to teach and a creative pursuit of relevancy in developing educational and community based art methodologies. Through a lifetime of achievement, Baca has stood for art in service of equity for all people. She is a lesson for us on the integration of one’s ethics with creative expression, never compromising and never flagging in her devotion to a practice that is committed to public education for all and to pedagogical process for its participants. Baca is a world-renowned painter and muralist, community arts pioneer, scholar and educator who has been teaching art in the UC system since 1983-1996 at UC Irvine and 1996-Present at UCLA Cesar E. Chavez Department of Chicana/o Studies and Department of World Arts and Cultures. She was the founder of the first City of Los Angeles Mural Program in 1974, which evolved into a community arts organization known as the Social and Public Art Resource Center (SPARC) which was has been creating sites of public memory since 1976. She continues to serve as its artistic director and focuses her creative energy in the UCLA/SPARC Cesar Chavez Digital Mural Lab, employing digital technology to co-create collaborative mural designs. Baca’s public arts initiatives reflect the lives and concerns of populations that have been historically disenfranchised, including women, the working poor, youth, the elderly and immigrant communities. Throughout Los Angeles and increasingly in national and international venues, SPARC’s projects have often been created in impoverished neighborhoods that have been revitalized and energized by the attention these murals have brought and the excitement they have generated. Underlying all of SPARC’s activities is the profound conviction that the voices of disenfranchised communities need to be heard and that the preservation of a vital commons is critical to a healthy civil society. Baca’s work channels the creative process of monumental mural design to develop models for the transformation of both physical and social environments in public spaces. And they are monumental, both in space and time: The Great Wall of Los Angeles is ‘tattooed’ along a flood control channel in the San Fernando Valley. It is currently the world’s longest mural, at 2,400 feet long. The Great Wall depicts a multi-cultural history of California from pre-history through the 1950’s. It was begun in 1976 and plans are underway for its next four decades of evolution. Baca’s murals are as much about the process of how they’re made as they are about the end result. She begins as an artist from the awareness that the land has memory that must be expressed and creates art that is shaped by an interactive relationship among history, people and place, that marks the dignity of hidden historical precedents, restores connections and stimulates new relationships into the future. i.e. university students, general public, children, youth, etc.